This condominium is part of a premier luxury resort overlooking Herradura Bay encompassing a private 600 acre reserve. A world class Marina, renowned golf course, beach club, spa and fully equipped gym makes staying at this resort a unique experience. The calm pacific waters of Costa Rica are easily accessible from the Marina, making it a premier offshore sport-fishing destination. The marina is both permanent home and temporary haven to some of the finest yachts, charters and fishing boats to grace the Pacific Coastal waters. Just 30 minutes out, enthusiasts will find some of the most prolific sport fishing on the planet. 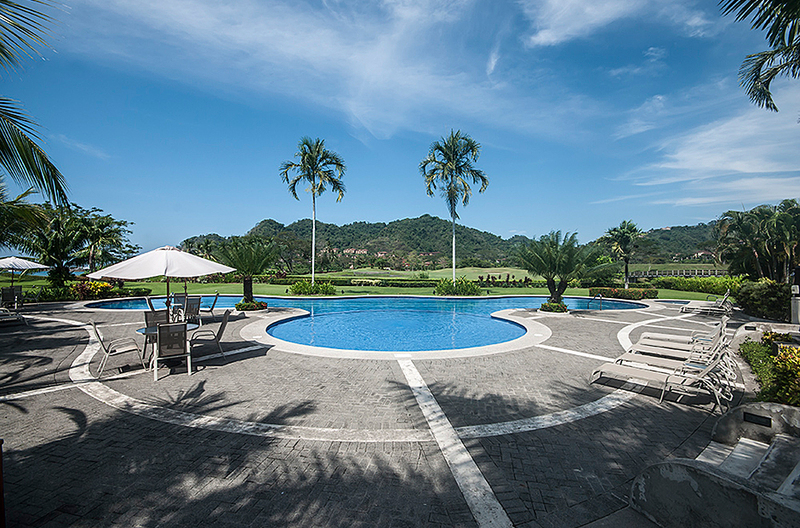 The 18 hole championship golf course is landscaped to blend seamlessly with the lush Costa Rican jungle that surrounds it, and situated to enjoy stunning ocean views. The golf course is home to an abundance of exotic native plants and animals as well as more than 150 species of birds. At the exclusive beach club you can find a grand pool with a swim up bar, ping-pong table, foosball table, playground, and volleyball court all within steps to the beach. Other amenities include art galleries, retail resort clothing shops, banking services, a car and golf cart rental shop and a grocery store. Located on the second floor, this oceanfront property has an unobstructed sunset view over the Pacific all year round, making it one of the best locations in the entire resort. This unit has been beautifully decorated by the resort's design center. Enjoy fabulous panoramic views of the rain forest, ocean, beach, and the resort, all which can be enjoyed by just gazing out the windows. With an open concept kitchen and living area, and an expanded terrace, it is one of the best spots in the entire resort to watch the waves and hear the tide. In addition to the grand pool at the beach club your condominium complex has its own private pool. This unit as with all units at this resort have their own pool area in addition to the beach club pool. Your concierge can help you plan adventures such as zip line canopy tours and whitewater river rafting, as well as all day tours like the Manuel Antonio National Park where you can see monkeys, sloths, toucans, butterflies, and large iguanas. Another full day tour is the Poas Volcano tour; at almost a mile across it’s the largest active crater in the world! Shorter tours include the monkey tour, canopy tour, and the crocodile tour. If you would like to take a break from the spectacular attractions, you can lounge by the pool, get a massage or just enjoy the beautiful view. If you are interested in surfing, you can take a short 15 minute drive to nearby for some of the best surfing in Costa Rica. This small beach town has a movie theater and a newly created Casino for evening entertainment. This condominium is just 60 minutes from the San Jose Airport. Please book early to get the villa of your choice. If the villa of your choice is not available on the requested dates please contact us and we will try to find you another suitable villa. We had a wonderful time staying at a Kosher Casas condominium. Needless to say Costa Rica was beautiful and the activities arranged by the concierge were exciting and fun for our whole family. The condo we stayed in was spacious and well appointed and we loved the gorgeous ocean view. What made the vacation truly relaxing and stress free were the kosher kitchen and food arranged by Kosher Casas. Bryna was really helpful and made sure that everything we needed was there. We highly recommend working with this company.